This col­lec­tion of 29 sto­ries, the first pub­li­ca­tion of PALH (Philip­pine Amer­i­can Lit­er­ary House) received crit­i­cal acclaim. Writ­ten by estab­lished and emerg­ing writ­ers, the book delves into uni­ver­sal but at the same time per­son­al themes of how it is to grow up Fil­ipino. It remains in print and is used by many edu­ca­tors in their class­rooms. 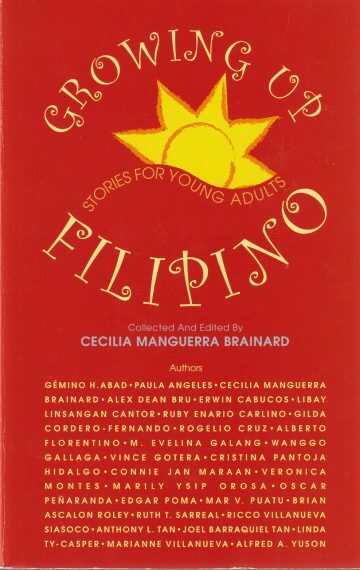 “Cecil­ia Manguer­ra Brainard has col­lect­ed a daz­zling and impres­sive array of 29 sto­ries about the saga of what it means to be young and Fil­ipino. The authors make the expe­ri­ences of ordi­nary young peo­ple come alive for us. The strength of the col­lab­o­ra­tive approach in this vol­ume lies in its indi­vid­ual exam­ples, for the best way to con­struct a pic­ture of grow­ing up Fil­ipino is by spe­cif­ic ref­er­ence to their lives. The struc­ture of the book is sim­ple enough. Each sto­ry is assigned to a theme and there are five of them: fam­i­ly, angst, friend­ship, love, and home.